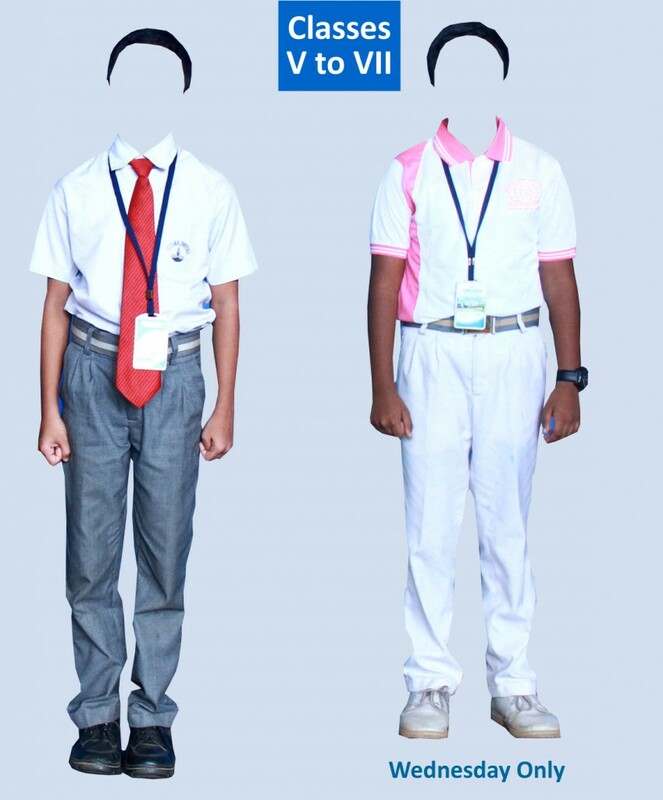 All the Students should strictly follow the dress code and uniform policy of the school. 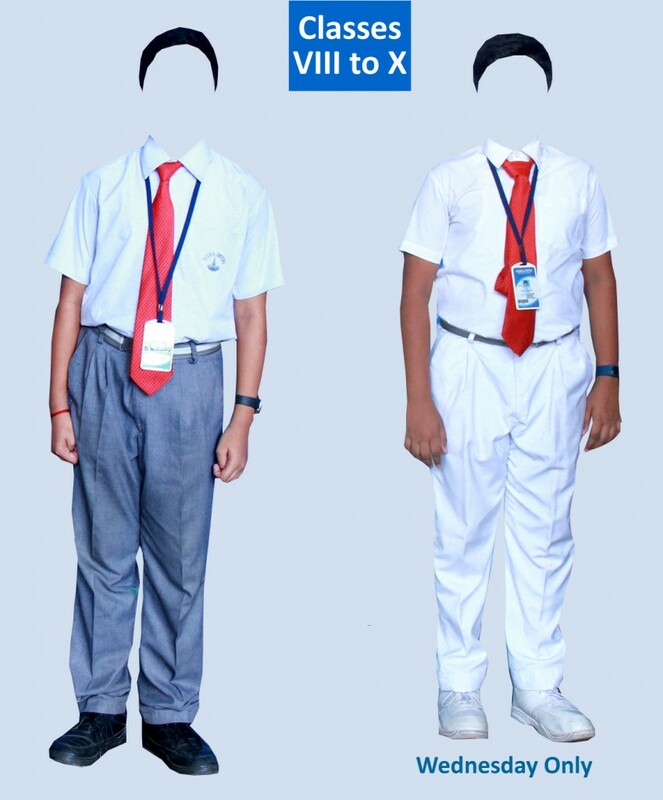 Students should be in neat and clean uniform on all days unless specified by the School Administration. 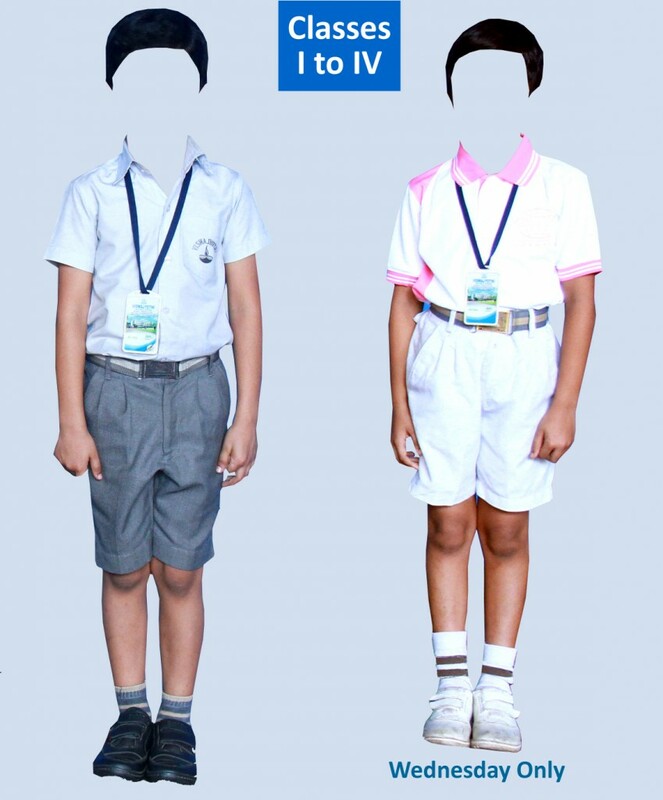 The School insists on ready-made uniforms with School Emblem for all Students to avoid difference in shades and patterns. Wednesday Uniform House Colour T-Shirt and White Half Trousers. White Shoes with Velcro, School Socks & School Belt. *Hair Style Hair should be neatly combed and properly set. Girls with hair length up to the ear should use Uniform Hair Bow, up to shoulder level should tie on both the sides and hair below the shoulder level should be pleated on both sides with Black Bands only. No Hair Clips or Fancy Bands are allowed. Accessories No Gold Ornaments, Expensive Wrist Watches, Fancy Bracelets, Nail Polish, Eye Liner etc. Wednesday Uniform House Colour T-Shirt and White Box Pleated Skirt. White Shoes with Buckle, School Socks & School Belt. Wednesday Uniform House Colour T-Shirt and White Executive Fit Pants. White Shoes with Lace, School Socks & School Belt. Wednesday Uniform White Half-Sleeved Shirt and White Executive Fit Pants. White Shoes with Lace, School Socks, School Belt & School Tie. Wednesday Uniform White Half-Sleeved Shirt with White Sleeveless Jacket and White Box Pleated Skirt. White Shoes with Buckle, School Socks, School Belt & School Tie. Wednesday Uniform Off White Half-Sleeved Shirt and Fawn Colour Executive Fit Pants. Black Shoes with Lace, School Socks, School Belt & School Tie. *Hair Style Hair should be neatly combed and properly set. Girls with hair length up to the ear should use Uniform Hair Bow, up to shoulder level should tie on both sides and hair below the shoulder level should be pleated on both sides with Black Bands only. No Hair Clips or Fancy Bands are allowed. Bracelets, Nail Polish, Eye Liner etc. Wednesday Uniform Off White Half-Sleeved Shirt with Fawn Colour Jacket and Fawn Colour Executive Pants. Black Half Shoes, School Socks, School Belt & School Tie. Skin Fit & Low Waist Trousers / Pants for Boys and Short / Tight fitting Skirts or Pants for Girls are not allowed. Boys should wear executive pants only. 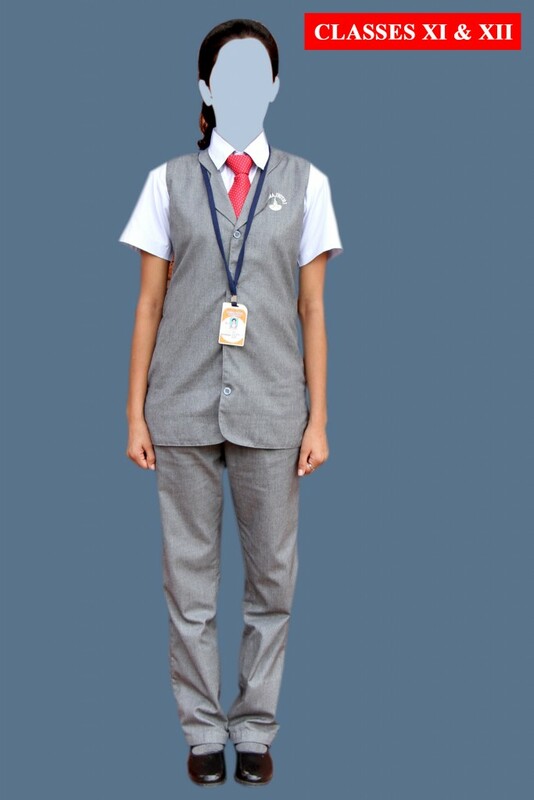 Colour dress is permitted to the student on their birthdays and during special occasions announced by the school. 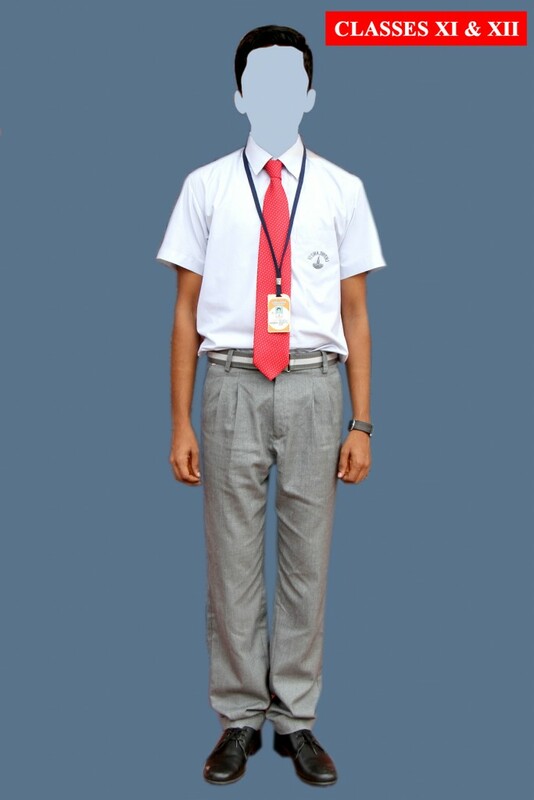 On such occasions, students are allowed to wear modest colour dress only. Black school shoe is compulsory for all. Fancy shoes and sports shoes are strictly not allowed. However, during monsoon, only black back strap sandals will be allowed as a part of the uniform. 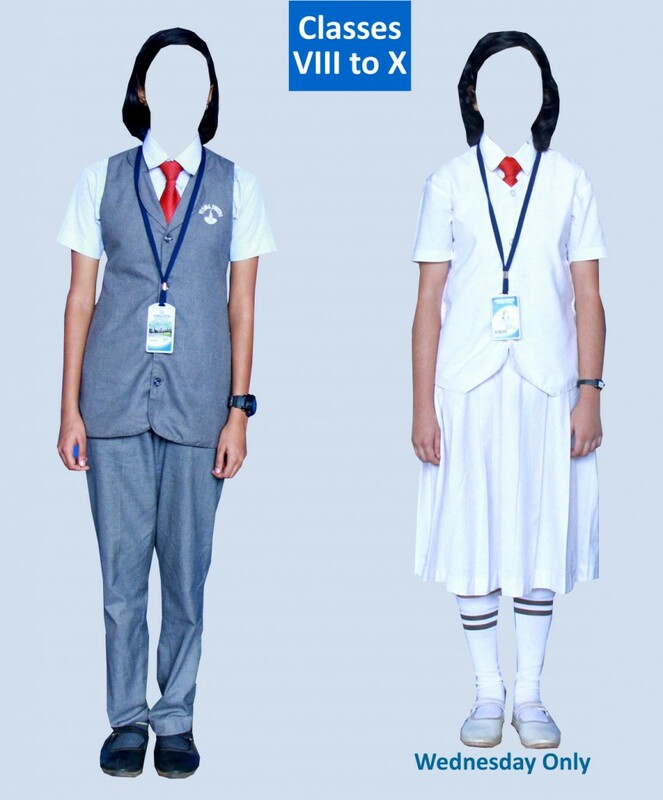 As School socks, School belt, School tie and ID card are part of the uniform, it is compulsory to wear on all the days. Vest for the boys and slips & tights for the girls are mandatory. 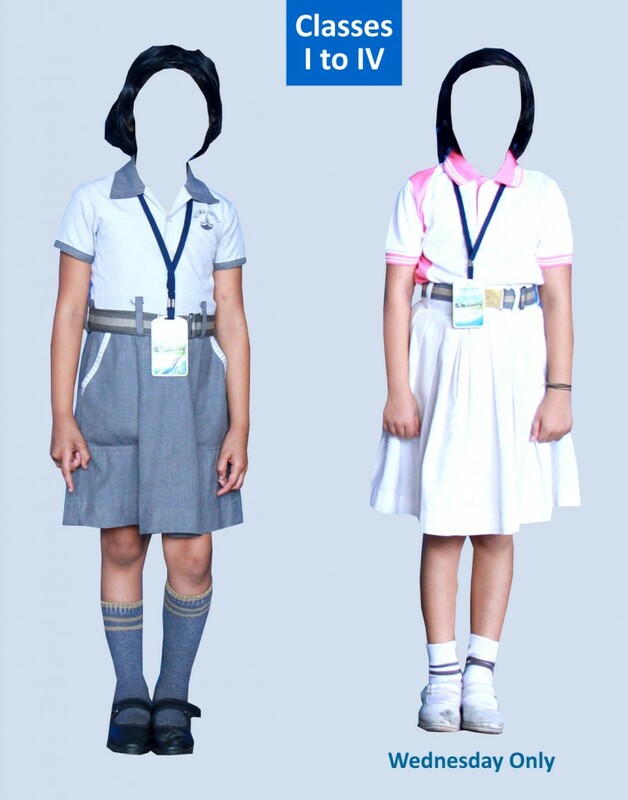 Girls’ frock / skirt should be up to the knee length and must wear long socks having length up to knee. 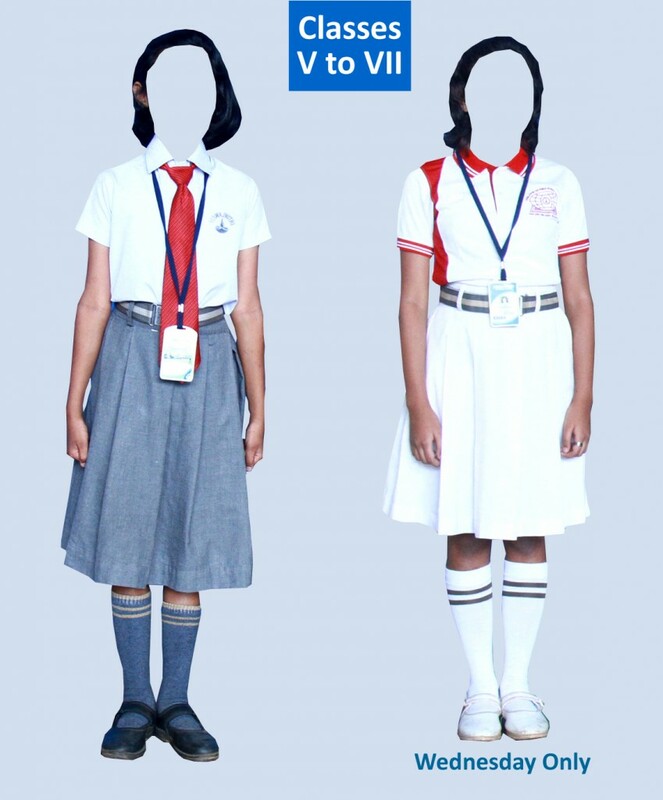 As part of following the strict uniform policy of the school and also to avoid difference in shades and patterns, the school insists on readymade uniforms with School Emblem for all the students. Expect one small ear stud for girls, no other jewellery is allowed for boys and girls. Fancy hair styles are not allowed for both boys and girls. Hair should be neatly combed and properly set. Hair should not fall on the forehead. Girls with hair length up to the ear should use black hair bow and all others should tie ponytail with band on all days. However, loose/open hair styles are not permitted. Students are not allowed to shave their heads. Boys should have regular haircuts and they should be clean shaved. Fancy jewellery / fancy watches / Gold ornaments / Hair clips /growing nail /nail polish / eye liner / makeup etc. are strictly not allowed.